Custom light up yoyo is an ultra "luminous" business toy for various reasons and it is favored by advertisers seeking cost effective promotional giveaway for kids. A customized light up yoyo will tie up kid's interest with various color patterns appearing with each spin and highlight your brand logo with ease (as it is empowered with modern lighting technology). Promotional light up yoyos are often favored by advertisers targeting kids in the age group of 1-5 or little older. Free artwork assistance and free online design proof are offered with every product. 100% customer satisfaction guaranteed. 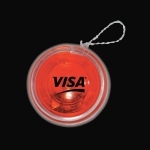 Custom light up yoyos are one of the oldest and most popular promotional kid toys used for brand building. This toy has been around for centuries and this is one reason why you should select logo printed promotional light up yoyos for your next campaign. Colorful light up yoyos are usually spun with a light flick of wrist and they will spin your brand logo into consciousness of your customers. From fun gatherings to tradeshows, customized yoyos are well-received and they make great stress busters for grown up adults too. You can see your brand logo taking a 360 degree spin over these customized yoyos. Promo4Kids carries a vast selection of custom printed light up yoyos in various assorted colors and shades that will make your brand logo shine in the dark. Do you want to make your brand logo visible in the dark? It is best to rely on these customized yoyos that will easily make it happen. Your brand logo will light up to everyone's amusement whenever someone pulls the strings of these yoyos in the dark. Kids and adults both love yoyos which is a big reason why you should select these spinning and shiny brand ambassadors for your campaign. Logo printed light up yoyos are perfect to gift during kids events, sports events, company picnics, summer camps and corporate events as well. It is sure that most kids who receive these yoyos will to indulge in swift rope tricks for their friends or crowds to see. This means your brand logo is all set to receive a good spin and appreciation from crowds gathered to watch the happy kid! 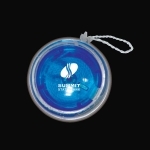 Promo4kids carries a thoughtful selection of light up yoyos in various colors and designs including translucent items that will easily spin and light up your brand logo. We are sure that you will easily find a light up yoyo that fits into your budget and compliments your campaign. To know more about business benefits, right imprint options and colors for your campaign, feel free to contact our team at 855-454-3786. Alternatively, you can write to us at info@promo4kids.com.